Spring has sprung and it is during this special time of year that people tend to show a little more skin. Some head out to the beach, to the lake, or some to an exotic locale. Some stay in their natural habitats, but generally everyone wears cooler ensembles that might showcase problem areas more than in the Fall and Winter months. Problem areas are okay, because nobody’s perfect. But nobody has to feel like a prisoner in their own skin. Nobody should have to resign themselves to live with the hand they were dealt, especially if dealt a less-than-desirable hand. It’s in this spirit that Beverly Hills Plastic Surgery Group would like to recommend some treatments and procedures that will help enhance your beauty, develop skin radiance, and focus on some of the areas of our body and skin that take the brunt end of environmental abuse, like UV rays, dirt, bacteria, toxins and pollutants. Sometimes diet and exercise aren’t enough to give us the beach body we want. It is for these such cases that CoolSculpting is a viable option. It’s a revolutionary treatment that freezes away unwanted pockets of fat, which can enhance your silhouette without resorting to surgery. CoolSculpting is fast and easy. Our CoolSculpting device addresses unwanted areas of fat, delivering controlled cooling to targeted areas. Patients may experience a slight pressure sensation, which can be followed by numbness in the treatment area. But what’s great about this procedure is that no pain or marked discomfort is generally experienced. What About the Safety of CoolSculpting Body Contouring? 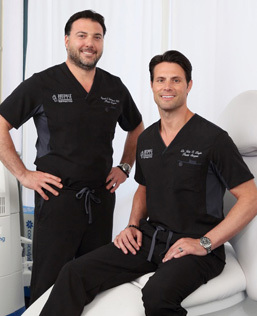 CoolSculpting has been cleared by the FDA after extensive clinical trials. There are no major risks or potential complications with this external procedure. Due to the fact that few patients will experience side effects (bruising, aching, pain and redness in the area after procedure in rare instances), we screen each patient to declare candidacy during the initial consultation. Skin resurfacing might sound intense, but it’s actually completely non-invasive. We focus on the area of treatment, utilizing a combination of services, whether that be laser blemish removal or chemical skin peels. We can help treat a wide array of wrinkles, fine lines, blemishes, blotches, acne scars, and unwanted creases. We custom tailor our treatment to achieve your aesthetic enhancement ambitions. It’s an unfortunate reality that there are 9 months out of the year where coarse leg hair is going to be the bane of a woman’s existence. The average woman will shave 7,718 times during their life, according to StatisticBrain.com. 58% of women use shaving as their main method for hair removal. Time quickly adds up, which amounts to thousands of hours spent shaving over the course of a lifetime. It’s not just women, either. Men have to deal with unwanted hair, whether it occurs on inconvenient areas of the face, the neck, shoulders, back, and more. The procedure may cause a minimal amount of discomfort, but we can apply a numbing agent as well as chilled air application. Spring is here and summer time is just around the corner. Let’s explore more lasting solutions to unwanted hair removal. If you’d like to learn more about any one of these innovative aesthetic enhancement procedures, contact Beverly Hills Plastic Surgery Group today at (310) 853-5147. We’re here to help you optimize your confidence for the Spring and Summertime.